Lisa Darling, Water Education Colorado’s trusted board president, has years of experience working with water reuse—we sat down with her to learn more. 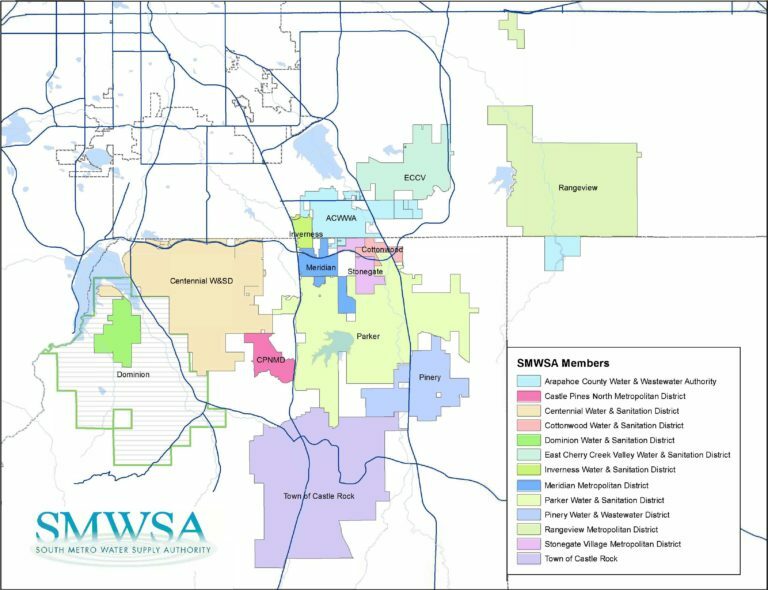 Lisa works as executive director of the South Metro Water Supply Authority (SMWSA), an organization that formed in 2004 when rapidly-growing south metro communities reliant on declining non-renewable groundwater realized they had to shift their water portfolios if they were to be sustainable. Now SMWSA relies on the Water Infrastructure and Supply Efficiency Partnership (WISE) between Denver Water, Aurora Water, and 13 SMWSA members, reusing water from Aurora’s Prairie Waters Project—which Lisa worked on for Aurora before moving to SMWSA in 2017. An excerpt of the interview is available in the fall 2018 issue of Headwaters magazine, but you can follow along with the full interview here! Why was the South Metro Water Supply Authority started? The South Metro Water Supply Authority was founded in 2004, right after the drought, and it was based on partnerships, investment and efficiency. So, the whole idea was we’re stronger together than we are apart, and if we use our money together, if we invest together, and invest in the future together, we’ll be stronger and we’re going to be the most efficient users of water of anybody, in terms of conservation, in terms of reuse, that’s our goal. We’re going to be state leaders. What is one of the aspirations or accomplishments of South Metro? [At South Metro] we’ve moved off of the non-renewable water resources significantly, to the point where at buildout, which is around 2065, only 15 percent of our water portfolios will be this non-tributary groundwater, everything else will be renewable supplies which is pretty incredible when you think that no one had any [renewable water], right? Can you give an example of how South Metro members are committed to efficiently reusing water? The Colorado water plan in 2015, had a goal of 129 GPCD (gallons per capita per day), [which is a measure of how you can use water] as a goal. That was an aspirational goal in the water plan, and we’re already like well below that as a usage rate … Meridian for example, they have closed loop systems, which means that they reuse every drop. They bring water in, they use it, they treat it, they use it for irrigation, they get it again, they use it, and so that’s called a closed loop and ideally that’s a way that you show that you are really efficiently using your water resources. Why did Prairie Waters start and what is its purpose? [City] council was fully supportive. They were like, “we have to find a solution, we have to find a solution really fast,” and so we looked at three river basins, three different basins, 50 different projects, all of these different yields. The City of Aurora ended up developing what’s called Prairie Waters, and it’s a reuse system that basically uses already decreed water resources, recaptures them, pipes them and pumps them all the way back home to Aurora, reuses them again, and then again, it’s just a big loop, like a loop system. And because those water rights [the city] already owns them, and they were decreed to be used and reused, that’s a decree term, that was a huge cost savings. So they built this huge project for $680 million dollars—below budget, ahead of schedule, it was great! How did Prairie Waters inspire the founding of the WISE partnership? In 2003, there was the mother of all snowfalls, we got like five feet of snow on Saint Patrick’s Day in 2003, so when I say intensity wise, that drought was really bad, lower than we’ve ever seen, but it was relatively short … so there, Aurora had developed this huge project basically to help, you know, further drought vulnerability, and then they were like, “now what do we do? We owe this money and we don’t want our rate payers to have to pay this money. We feel good for future droughts, but we kind of have, like this thing sitting there, how can we make use of it to help offset the rates?” At the same time, Denver had some water that was up north that they wanted to bring back in emergencies and they were like, “how can we do that? Oh wait, Prairie Waters. If we can borrow Prairie Waters!” And then South Metro was sitting there like, “hey guys, were interested in extra water and capacity in that project,” and so the three parties are the three partners of the WISE Partnership, which is the Water Infrastructure and Supply Efficiency partnership. It’s basically a mechanism way South Metro gets renewable water resources, when they are available, from Aurora and Denver. When Aurora needs its project back and its water back, South Metro is turned off. When Denver needs to move its water through Prairie Waters, they have an agreement with Aurora, South Metro is off, but Denver is able to bring their water back. So, it kind of works in this really cool system. So, that’s one of the projects that we’ve developed in terms of sustainable water resources. Are there ways other organizations and businesses can look to reuse water? So, what you’re seeing is organizations and municipal water providers looking at opportunities to do what’s called indirect reuse and direct potable reuse. Direct potable reuse is basically, it goes through a system and then it’s completely treated. You would treat it to drinking water standards, and then directly reuse it. Indirect is usually treated to a wastewater standard, a tertiary standard, put back into a stream system and then pulled out again, and then taken into some sort of system and then rediverted and then retreated into distribution so it doesn’t go directly from treatment back to the tap. There’s a space in between it, which some people, I think just because people don’t understand it, some people might find that more palatable, but the fact is that [direct potable reuse] works, and I think it’s the way of the future. I think we are all going to have to accept and promote those kinds of programs with our water providers in the future and there’s a whole bunch of new technology that’s happening that is pretty cool. How much of an impact will water reuse in the South Metro District have on the sustainability of Colorado for future generations? Any time you reuse water you’re not going out and buying more water, right? So, if you assume that build out does come, you’re going to reach a time of balance, where you’re as far as you can go, but water resources will still fluctuate, there’s still seasonal variability, there’s still floods and droughts, there’s weather events, severe weather events, there’s a lot that can impact that. The more you have a secure system in that you know you have water that is always available, you know you can treat it, you know you can use it, you know you can recapture it, you know you can treat it, it gives you that guarantee, you know, it’s so important to the quality of life. I don’t think that people realize. If you had to wait to take a shower [like you’re stuck in traffic] on I-25, I heard somebody say this one time, if for 50 minutes you couldn’t take a shower—50 minutes you’re stuck there. Everyone would be like, “oh my gosh, there is a problem with the water just like there’s a problem with transportation. There’s too much traffic. Somebody has to fix it.” But that doesn’t happen. You turn on your tap and the water comes out so we don’t have that same visibility. People are like, when I need water, all I have to do is do this, (*turns knob*), and out it comes whenever I want, and I can use whatever I want and then I turn it off. So, it’s in times when you see real moves towards new innovation, it’s in times of need, because when you have a lot of [water], you just don’t realize what you need to do to sustain it. How did people perceive the WISE project when it came online? Has public perception been a challenge with that project? Everybody has been like what a great idea, this is a great project, you know, I think that there’s a danger, you reach a certain amount of success and you are telling people about it and they’re like, “oh, this is great!” and then you go off and you actually do it … So the public perception hasn’t been a challenge at all in fact, it’s been really rewarding. What is more challenging, is actually [implementation]. You know, everybody sitting around a table shaking hands is one thing, taking a thirty-page agreement and saying “now, go do this,” that’s a lot harder. How important is collaboration for WISE? Keep in mind that WISE is not the final solution, right? It just a piece so we all call it water portfolios. Your water it’s like a stock portfolio, right? It’s all made up of different pieces. WISE is just a piece, and there’s a contractual obligation so collaboration is essential … It’s not just a handshake and so neither Denver, nor Aurora, nor South Metro Water Supply Authority could ever not fulfill their end of that bargain to the extent that we all legally can—there are obviously acts of God that could happen. But [collaboration] is never a concern, it just makes sense, you can’t build a big project on your own, I mean you could, but why would you? Why wouldn’t you get a partner who can share it and share the costs and share the challenges and the successes and so you know, just putting those pieces together. I don’t see people going their own way at all anymore … collaboration is the way of the future, it’s the way of the present, it’s what we’re doing now, we don’t really have a choice. What has being a board member of WEco taught you? Everyone gets to a point in their career or their life where they want to give back to something, right? I feel really blessed that the thing that I get to give something back to is also associated with what I do day-to-day, which is actually really unique. So, I wanted to do something in water that wasn’t simply about an organization or a region, it has a much broader impact, it has just a much broader footprint, and so I’ve just really appreciated being a part of the conversation and kind of pushing that conversation forward and it’s been really rewarding. And I’ve met great people and have a lot of fun and with the state water education programs and our water programs, you know, I think we have the ability to be a leader in the country in education programs surrounding water so I’m excited! Congress has given its approval to the historic Colorado River Drought Plan. A new study seeks better methods for measuring evaporative losses on Lake Powell.